On July 27, 2012, my publishing partner, John Amiard Oberteuffer and I succeeded in submitting to CreateSpace.com the manuscript, cover, and supporting information about the enlarged Reminiscences of my father, Charles D. Coryell, prepared in 1960 for the Columbia University Oral History Research Center, Joan Bainbridge Safford, interviewer. 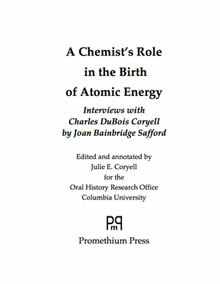 The new title is A Chemist’s Role at the Birth of Atomic Energy. In October 2011, when Seelye and I traveled to Massachusetts, to celebrate my 50th Reunion from Lexington High School, we visited John Oberteuffer and Kathy Mockett who reside there and in Brewster, on Cape Cod. John and Seelye are classmates from LHS ’58, seniors, the year my classmates were freshmen. John’s father and grandfather were talented painters. As a post-doc at MIT, John worked on the MIT reactor nearby Charles’ A. A. Noyes Nuclear Chemistry Center. John has self-published as John Amiard, Swedish Blood, a detective story inspired by family ties. 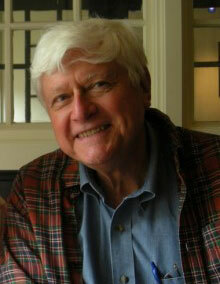 John graciously volunteered to help me publish the Reminiscences. In May 2012, when Seelye and I traveled to Boston again for Seelye’s 50th college reunion, John and I set to work in earnest, founding Promethium Press, and making decisions how best to collaborate across the continent. Today is the culmination and the beginning of the next step: preparing the eBook version. In history, on July 27ths 1501, Copernicus became canon of Frauenberg Cathedral, 1866, the Trans-Atlantic cable was laid, and 1940, “The Wild Hare,” Bugs Bunny debuted.